This post is sponsored by DownEast Home. I'm in the process of working on my master suite. It's about time. As you can see from the photo below (of the room in its BEFORE state), nothing is wrong with the room really...it's just that I've lived here for over two years, and I am finally giving the room some real attention. And today, I'm coming to you, my dear readers for your opinion. I was given a gift card from one of my favorite stores - DownEast Home - so that I could review some of their products. For those of you who haven't heard of DownEast Home, perhaps you've heard of their sister company, DownEast Outfitters. 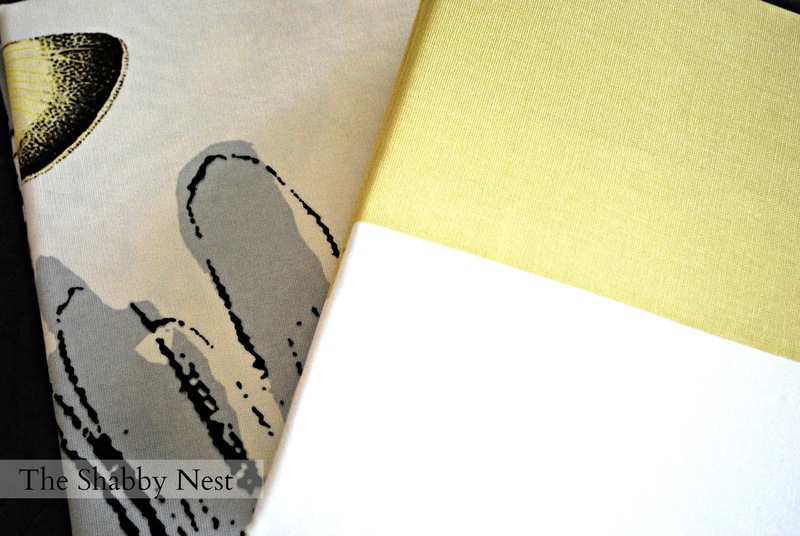 Well, I love both the clothes from DownEast Basics and the Home wares from DownEast Home. So I was excited to have this chance. Off I went, gift card in hand, to my closest DownEast Home. I drooled over their new furniture lines. But I had something a little smaller in mind. A shower curtain for my master bath. DownEast not only has its own line of home wares, it also carries overstocks and seconds from national stores. And I lucked out...I found two ADORABLE shower curtains. I couldn't decide between them...so I'm turning to you. Both of the shower curtains are made of a nice thick cotton with a beautiful drape. They are both bright and pretty and I love them both for different reasons. Option 1: The things I love about this shower curtain are it's sassy cabana stripes, the lively yellow color - which I'm bringing into the new color scheme of the master bedroom - and the youthful fun it brings to my master bath. Option 2: One of the things I love about this shower curtain is it's more muted palette with the grays that I love so much and just a touch of yellow. I also love the fact that it has butterflies because I have a butterfly photo I'm incorporating into a gallery wall in my master bedroom. So which do you like better, dear reader? I'd love your opinion. Please let me know your choice in the comments. And thank you to DownEast for the gift card and the chance to review their merchandise. The opinions expressed in this post are 100% mine. I am a fan of butterflies but I do like OPtion 1 best. Definitely Option 1. I suspect you will like it better over time, not get tired of it. It doesn't limit you in adding other elements. My fave for sure. I love option 1. The butterflies are sweet for sure, but maybe a bit trendy? I wonder if you put both up at the same time and flip one to the back and then pull it forward every few hours while your deciding. Every time you walk in stop and think, which makes you smile bigger. Even if it's the butterflies, then go for that one. It's just a shower curtain and can be changed easy. May I be so bold as to suggest keeping both and switch them out seasonally? :D In my perfect world, that's what I would do if it was in the budget. Option 2! Love the gray! 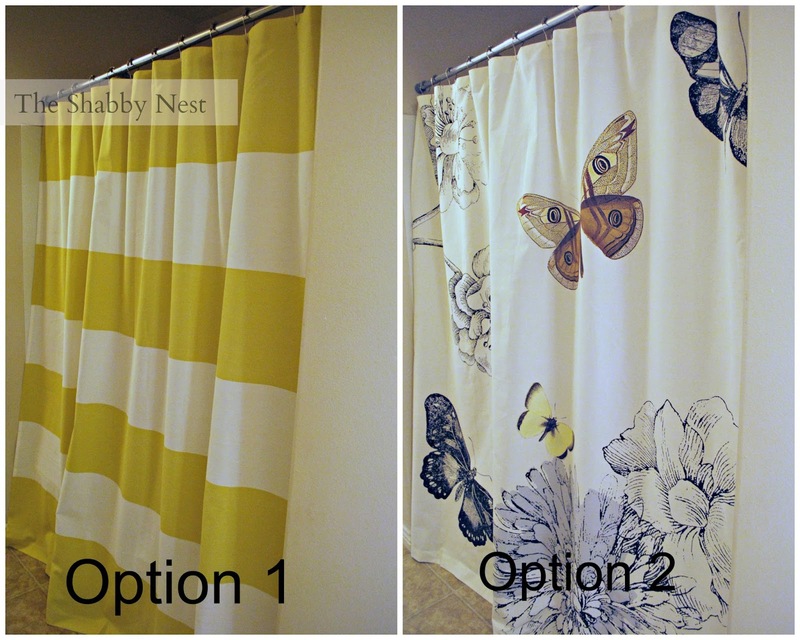 Both are lovely, but I'm leaning towards the touch of sassy yellow stripes. I love a good yellow! love the butterflies... not too much, great use of the color while also using your grey. the butterflies remind me of how fragile and precious and beautiful life is... great way to remember daily. love that!!!! Option 1 is best. Option 2 just doesn't seem very sophisticated or even fashionable. I like option 1 for the bathroom. Maybe you could make some butterfly pillows out of the other one for your bed? I like Option 1 the best..you could decorate around that color scheme easily! Option 2!!!! I just bought the same curtain at Downeast yesterday. It's hanging in our bathroom and I love it. Everyone is doing stripes now. I like that the butterflies are different. I also think option 2 works better with your floor. Option one brings out too many gold tones. #1- by far is my favorite! The yellow stripes. I find it to be more versatile and I just naturally love it! So sunny and fresh! I definitely like the stripes better. I think I would tire of the butterflies pretty quickly. You could add anything with the stripes and they would always work. Plus, I shower in the morning so it would be like a sunrise greeting me. I fell in love with the butterflies curtain! Do they have a website? One. By far! Disclaimer: butterflies have always been too "cutesy" for my taste. Stripes, fo sho. Way cute. #2 Love it. I'm over stripes. They are yesterdays news. You aren't yesterday you are the day after tomorrow :) That said--ignore all of us and go with the one you love most or you will have a curtain you wish you hadn't bought like a shirt your friend loved that you like but never wear cause it's just not you.